The Tag Selector displays the entire chain of tags that apply to the current selection or to the cursor position. 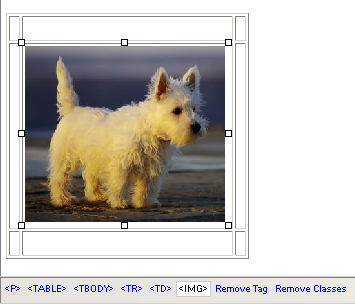 You can use the Tag Selector to quickly select any of the page elements. Simply place the cursor on them, or on elements they contain: say you want to select a table with invisible borders, and that includes links/images/movies; place the cursor inside the table and simply click the <table> tag in the Tag Selector. In the editable region you will see the table selected (you can consider the example above to see what happens). When you select an element using the Tag Selector, its corresponding tag will be displayed the last one in the Tag Selector, and all its child tags are ignored. 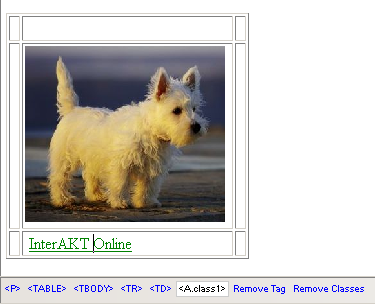 Remove Tag - it removes the selected tag from the page. Any elements that are contained in that tag will be removed (e.g. the cells and table content when you remove a <table> tag). Remove classes - it deletes the CSS class that is applied to the selected tag. It only removes it from the tag, not from the CSS file as well.